Hello and happy Tuesday. It's time for another challenge at CASology. 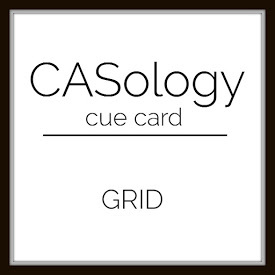 This week, our cue word is GRID. I pulled out an old PTI stamp set Guidelines II and faintly stamped the grid pattern, then proceeded to fill in the grid with other stamps from that set. Now it's your turn. How does GRID inspire you? I hope you play along this week. Please remember to keep it Clean and Simple. Very clever and beautiful design, Joyce! I love your choice of stamps and colors with your lovely CAS design! Fabulous take on the cue card! Love the colors you used, Joyce. Great stamping too. Who knew that a grid could be so pretty! This is an amazing take on the cue word! Absolutely beautiful Joyce...love the wonderful colors you used and your fabulous design!